The “S.S. Brighton” as it was known locally, was built on the original site of the George Inn, situated near the bottom of West Street, Brighton. Charles II reputedly stayed at the inn overnight in October 1651, during his escape to France. A branch of oak was hung out of the upper window on every anniversary of his stay thereafter. The inn later changed its name to the Kings Head. It was rebuilt in the twentieth century, but was demolished in the early part of 1933. The “S.S. Brighton”, a contraction of “Swimming Stadium Brighton”, was opened on the 29th of June 1934. 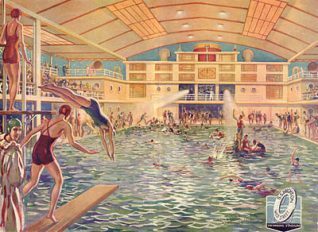 It was built by W. Hayward & Sons (Bournemouth) Ltd and billed as the largest covered seawater swimming pool in the world. One of the first swimmers to dive from the 10 metre diving stage was Johnny Weismuller, the Olympic World Champion, who went on to Hollywood film fame as “Tarzan”. Unfortunately, after its initial success, the popularity of the “S.S. Brighton” as a swimming pool began to decline. Due to the very hot summers of 1934 and 1935, local people and visitors to the town seemed to prefer the sea or open air baths. The management decided to turn the pool into an ice rink, though only on a temporary basis. The heyday of the “S.S. Brighton” as the largest covered swimming pool in the world was over. On the 29th of September it closed its doors to the public, just fifteen months after it had opened. Whilst this was the end the pool, it was not the end of the S.S. Brighton. Seventeen days later, on the 16th of October 1935, the swimming pool was reborn as the “Sports Stadium”. The new ice rink was an instant success with the people of Brighton and dominated the south coast as the top entertainment venue for the next thirty years. The “Brighton Tigers” Ice Hockey Team was formed in October, 1935 and was an immediate success with the locals. The Tigers, clad in their familiar black and yellow kit, continued to pack the crowds into the rink right up until the beginning of World War II. In the team’s thirty-year history, they won every trophy there was to win in the world of ice hockey. Whilst ice hockey provided a substantial income for the rink, its financial future was secured by the first ice spectacular staged in 1936. “Marina” was the brainchild of Claude Langdon, then managing director, and Denis Mitchell, the general manager. This new ice spectacular was an instant success and caught the imagination of the public. This was to prove the beginning of the rink’s fame as the top ice show venue outside of London. The post war years saw some of the best ice shows ever at the rink. They were produced by the famous impresario Tom Arnold, under the watchful eye of his co-producer Gerald Palmer. The front of house was presided over by the managing director Benny Lee who took over the role in 1951. Ever present to greet the stars, he was the epitome of the best-dressed man in town and was rarely seen without his trademark – a large Havana cigar. Benny Lee was probably the finest spokesman for entertainment the town will ever see. His final comment on the demolition in 1965 was – “the day the council demolished the S.S. Brighton, they tore the sporting heart out of the town”. My parents were professional ice skaters in the 40s and 50s – Jack Harnett and Monica Willard. Both, like me, from Brighton. I have some vague memories of the SS Brighton as I went to a few Ice Shows there as you would expect. My uncle, Roy Harnett, played for the Tigers and was in the 1948 Olympic squad. I was never encouraged to skate so I did not start until I was 14, far too late to become a professional. I do skate and ski professionally now, in my late 50s, but as a cimematographer for our own TV series! My parents wanted me to have a proper job, which was hard for a kid who, due to his parents touring in Ice Shows, went to 15 schools (none in Brighton). I joined the BBC and Southern TV coming back to Brighton to do the political conferences. I still keep contact with some of my parents’ old skating chums as many are linked to Switzerland and the ice background. My passion for the Volks railway must have got to me as my camera operator wife and I have made a long running TV series about the railways of Switzerland. My favourite was the railway from St. Moritz to Tirano in Italy. We filmed over 2 winters, sometimes in temperatures of below -30C, so I guess the rinkside practice at the SS Brighton stood me in good stead. Incidentally the film and TV industry is even more uncertain than life as a professional skater so my parents’ wish for me to have a ‘proper job’ is, however, unlikely to be fulfilled! Hi Chris – If you give me a buzz on ssbrighton@hotmail.com I’ll show you photos of Jack & Monica & Roy who I knew very well. Best regards. Roy Harnett was my grandad, unfortunately he died a few years ago now. We still have his trophies and pictures from his days in the Tigers though. Trevor, if you have any more we would love to see them! Many thanks. My dad was Roy Harnett, I was thrilled to see the message above from my cousin Chris who I haven’t seen for a hundred years! Also lovely to see the message from my son Gary… I would love to see some more pictures of my dad, sadly he died too young 11 years ago. I have his Olympic certificate hanging in pride of place at home. Would love to hear from you Trevor regarding anything at all to do with Dad. I am looking through my mother’s memorabilia and there is much about the SS Brighton and the Bull Frogs, a place a lot of the skaters went to in the evening after the show. I will scan more programmes and photos for Trevor to put on if he wishes. There are some of lots of the girls in a line as well as show / publicity material. If Lisa is looking for more info on the family, I have some pictures as well as the family tree which is private at the moment on Ancestry, contact through our MITV Swiss rail journeys site on the net. My second cousins owned Chelsea football club and Stamford Bridge at one time and my nieces were in the winter Olympics this year so the family are still up there in the sports league. Years of horse riding, skiing and skating have taken their toll on my knees but I am still a mean toboggan rider when I can get on the runs in Switzerland! Lisa! I haven’t seen you since we were at school! My dad and your dad and Uncle Jack were all very close friends from the Brighton Tigers days. My dad was John (Johnny) Holmes who also played for the Tigers. Sorry to hear that they have passed away, my Dad also. Hi Chris, I am an ex professional ice skater and I remember your mum and dad, from Brighton and the Wembley shows. I wonder whether the archives at the BBC would have any videos of Ice Circus 1952. I spent many happy hours and most of my weekends enjoying the old ice rink where my mother Connie Hansom was attendant in skate hire and on the south balcony. Editor’s note: I am sorry Neil but we do not have any hard copy records and the person who wrote this article is no longer with us. Sorry. This is for Chris Harnett and anyone who knows of the Bull Frogs club. I’m trying to source any info on it as my dad performed there during WW2. Could you please get in touch with me email timothywhitehead167@btintetnet.com thank you. Dear all, my name is Cristian Uguzzoni and I’m a tennis historian. I live in USA, Miami, so I can’t go there to run my research. Brighton was a very popular destination for professional tennis in the 50s and the 60s. The pros played at the Sports Stadium in Brighton almost every year from 1951 to 1965. All the legends of our sport played there: Pancho Gonzales, Pancho Segura, Rod Laver, Ken Rosewall, Andres Gimeno, Lew Hoad. I have all the dates they played there but unfortunately I don’t have all the results. Do you have any information in your archives? If I provide you the names of the players involved in every year event (it was a one day event), could you help me in my research?